Assam Police arrested over ground workers OWG of NDFB-s groups on the basis of specific input. Chirang Police under the leadership of SP Chirang launched a 48 hour operation starting from 02/07/16 leading to apprehension of one NDFB ( S ) Over Ground Worker ( OGW) Pinkush Narzary. During interrogation of 23 years old Narzary, it has come to light that through Social Media networking site Facebook, Ranjit Basumatary @ Ferrenga General Secretary of banned organisation NDFB-S created some fake accounts and established contact with Pinkush and motivated and instructed him to collect extortion money in Bengtol area. 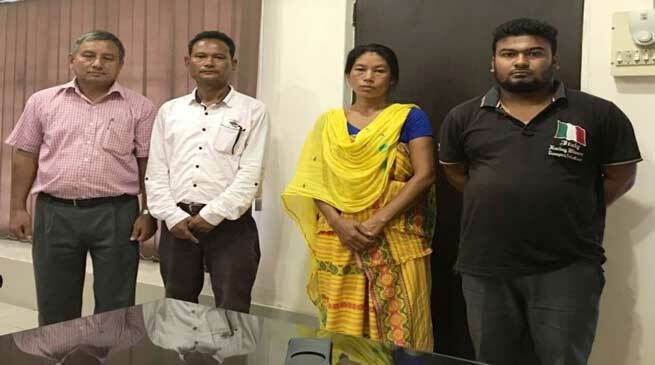 Subsequently he collected Rs 31000 from one Pradip Narzary, Asst Teacher in Bengtol MV School and Rs 12865 from one Jitendra Narzary who is Principal Tukrajhar HS School. The money was further handed over to Monika Basumatary W/ O Ranjit Basumatary @ Ferrenga who passed it on to the banned organisation. All the above mentioned OGWs have been arrested on charges of terror financing and stringent provisions of UAP Act have been invoked. Total 4 mobile phones and Rs 13000 extorted cash has been recovered. The whole ops was closely supervised and monitored by Dr L.R.Bishnoi, ADGP,BTAD. Further investigation is on to unearth the full design of the banned organisation.